Rarely do I do a follow up post. Here's one. 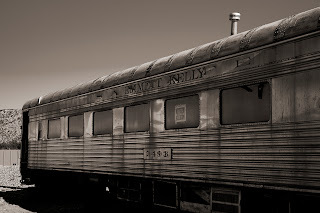 The railroad car shown above displays the words Emmett Kelly painted over the words Santa Fe as you can see. 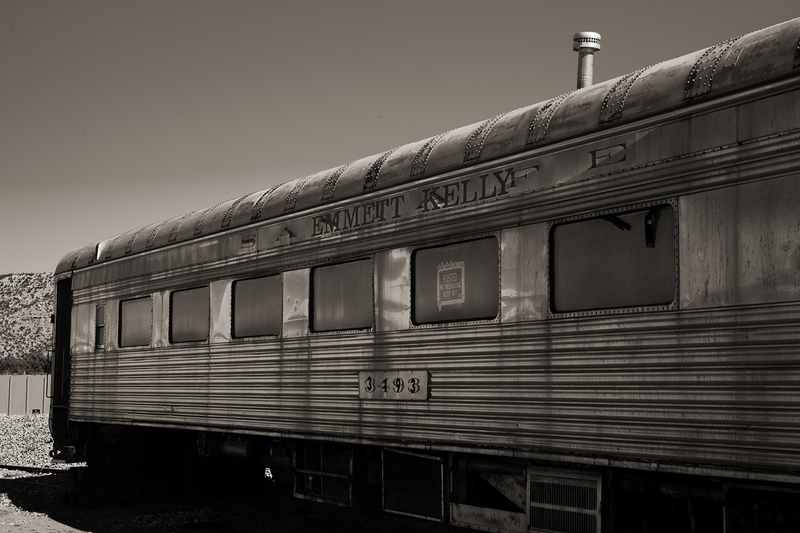 We can deduce that Emmett’s name was affixed at a later time probably after the car was decommssioned or sold to the Verde Canyon Railroad. This follow up is prompted by an email from my long time friend Lenny Levenson in Florida. It seems that Lenny posted today’s blog post to flikr and that elicited a response from Emmett Kelly’s son-in-law Steve Woodburn. This is all this morning, folks. Mr. Woodburn said that Emmett had retired to Arizona where he became active in civic affairs and he was likely honored for his good works with the Emmett Kelly rail car. That’s as logical a scenario as any. But another friend Jim Rogers in Dallas wondered if Kelly had been a big enough star to warrant his own car. I had wondered as much. Then I did a little research that indicated Kelly died and was buried near his home in Sarasota. That muddys the water a tad until you compute that Sarasota is the winter home of the Ringling Brothers circus and it's fitting that he be buried there. One supposition begets another question. Followups are good, Steve, especially this one, given the strength of the image!